The passenger compartment of the Karl remained stable in the frontal offset test. Examination of the high speed films and of the dummy traces showed that the head of the driver dummy was not stable on the airbag. There was insufficient pressure in the airbag to prevent the head from flattening it and the head made contact, through the deflated bag, with the steering wheel. Thereafter, the head was unstable and rolled off the steering wheel to one side. The score for head protection was penalised and its protection was rated as adequate. Dummy readings in the lower leg indicated marginal protection of this part of the body for the driver. In the full-width rigid barrier frontal impact, the driver's pelvis slid beneath the part of the seatbelt passing over the lap. This is known as 'submarining' and presents risks to the knee, femur and pelvis. The score for this body region was penalised and protection was rated as poor. In the side barrier test, the Karl scored maximum points with good protection of all body regions. However, in the more severe side pole test, dummy readings showed very high rib deflections and protection of the chest was rated as poor, indicating a high risk of serious injury. 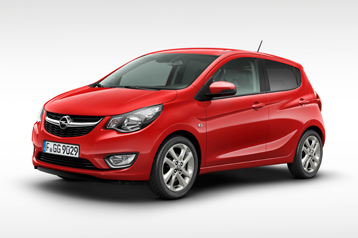 Opel intend to make improvements to the chest protection in side impacts. 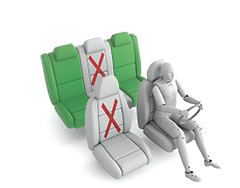 The front seats and head restraints showed a marginal level of protection against whiplash injury in the event of the rear-end collision. 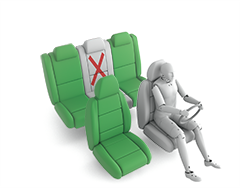 A geometric assessment of the rear seats indicated the same level of whiplash protection for the rear seat occupants. Autonomous emergency braking is not available on the Karl. The Karl scored maximum points for its protection of the 1½ year dummy in the dynamic crash tests. In the frontal offset barrier test, forward movement of the 3 year dummy, sat in a forward-facing restraint, was not excessive although chest and neck decelerations were marginally high. In the side impact barrier test, the 1½ year dummy was properly contained within the shell of its restraint, minimising the likelihood of head contact with parts of the car interior. However, the surface of the 3 year dummy's head was just outside the outer wing of the restraint and scored no points for head containment. The front passenger airbag can be disabled to allow a rearward-facing child restraint to be used in that seating position. Clear information is provided to the driver regarding the status of the airbag and the system was rewarded. All of the child restraint types for which the Karl is designed could be properly installed and accommodated in the car. The bumper scored maximum points, providing good protection to pedestrians' legs in all areas tested. The protection offered to the pelvic region was far more mixed, some areas performing well and some poorly. The protection provided to the head of a struck pedestrian was predominantly good or adequate on the bonnet surface and on the windscreen, with poor protection observed at the base of the windscreen and on the stiff windscreen pillars. The Karl has electronic stability control as standard, together with a seatbelt reminder system for the front and rear seats. A driver-set speed limiter is an option, as is a lane departure warning system. The Karl does not have an autonomous emergency braking system.